When you think of an American IPA, or an American-style-anything, you think HOPS. Add ALL the hops! In fact, Lagunitas’ own description of their IPA is “made with 43 different hops.” Wait, really?! Forty-three, eh? This might be tongue in cheek marketing speak, but it’s a pretty accurate depiction of the “American IPA attitude” when it comes to proving your worth in the IPA category–the hoppier, the better. To make matters even more ‘Merican, I opened each of the bottled IPAs with a special bottle-opener courtesy of my friends at Bullets2Bandages. Bullets2Bandages is a veteran owned company that donates 15% of their profits to veteran focused charities. They were kind enough to send me a personalized ‘Merica .50 Caliber Bottle Opener, and I tested it out on these American-made beers. This opener is 100% made in America from once-fired, military grade brass casings and demilitarized projectiles. After the brass is collected from military training ranges, Bullets2Bandages buys it in government auctions then presses the projectiles, cuts the notch, and polishes them up before engraving and selling them. I’m honored to have one of these openers with the Worth1000Beers logo engraved on the side. Thank you, Bullets2Bandages! Joshua Bernstein (Brewed Awakening) reminds us that, “according to lore [the IPA] was created when British brewers highly hopped ales to preserve them during long ocean voyages” to their colonies in India. But by this definition, the American IPA of today really doesn’t fulfill this requirement. As the BJCP Guidelines put it, “The term “IPA” is intentionally not spelled out as “India Pale Ale” since none of these beers historically went to India, and many aren’t pale. 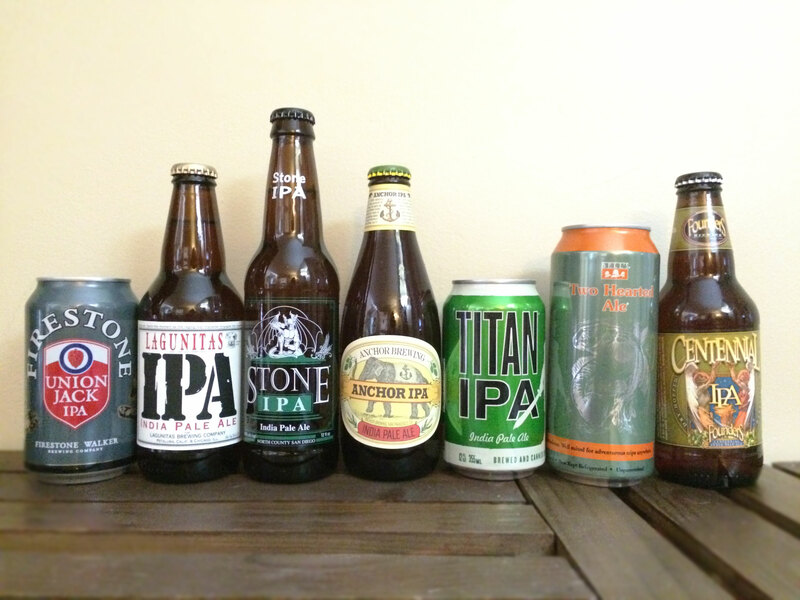 However, the term IPA has come to be a balance-defined style in modern craft beer.” Therefore, it makes sense that the new guidelines have separated English IPAs from American and from other IPA styles. The Anchor website says this beer is brewed with Cascade, Bravo, and Apollo hops, and dry-hopped with Cascade, Apollo, Citra, Nelson Sauvin, and Haas Experimental No. 43. “Made with 43 different hops,” according to the Lagunitas website. AllAboutBeer.com’s review of this beer claims this enormous hop bill includes Horizon, Cascade, Patheticque, Emperor, and Eroica. The brewery website names Magnum, Cascade, and Centennial as brew additions, and Amarillo, Cascade, Centennial, Citra, Chinook, and Simcoe as dry-hop additions. Magnum, Chinook, and Centennial hops are listed on the brewery’s site. I couldn’t find much of anything in terms of a hop bill for this one, but multiple home-brew clone recipes cite Amarillo and Simcoe for for bittering, Amarillo and Columbus for aroma and Columbus for dry-hopping. The Bell’s website describes this as a single hop IPA, hopped exclusively with Centennial hops. According to this article, brewed with Centennial hops and dry-hopped with Centennial hops. They named this beer appropriately, methinks. Ranging from a lighter straw-gold to an orange amber color, most of these fell in between these two extremes with Anchor IPA being the darkest (copper-orange in hue) and Two Hearted and Centennial IPA being the lightest. The rest were golden in color. All had powerful aromas that sprung out of their glasses, the only exception being Great Divide’s Titan IPA which had a soft and milky raspberry creamsicle aroma. The rest exploded with pine resin, malt, orange peel, orange juice, grapefruit, lemon, honey, malty sweetness, sticky orange syrup, or herbal lemon tea. Only the Anchor IPA smelled slightly solvently, and Stone’s stood out as different with an exceptionally earthy, floral grapefruit nose unlike the others. Anchor IPA had the most pleasant mouthfeel, with super soft and creamy bubbles that expanded to fill my mouth as I drank, and this was countered by a very drying finish. Centennial IPA, Lagunitas IPA, and Two Hearted all were medium-full, but oily and therefore less creamy, although Centennial was a bit syrupy. Titan IPA, Stone IPA, and Union Jack were all thinner in body, and oily from hops as well. While my go-to IPA is typically Two Hearted, I was surprised to find that it came in at a close second to Lagunitas IPA, the beer with “43 different hops.” This beer was balanced between an incredible bitterness and a remarkably quenching sweet orange juice, like a teeter totter of flavors that made me thirst for more. And finally, a word on the .50 Caliber Bottle Opener: This little guy was super strong and felt more durable than any bottle opener I’ve ever used before. I think it makes a great conversation piece and serves an even greater cause. Whether you support Army, Navy, Air Force, or Marine Corps, or just want to help our service men and women heal when they return home, this bottle-opener or any one of the Bullets2Bandages products would be a great way to help out America’s bravest. One more time … ‘MERICA!